Each state has different requirements so always check out what your state’s laws are! Here is a list of websites that have great educational games or lessons! Check them out!!! I would love to hear about some of your favorite sites so leave them in the comments below!!! Check back often, I will be adding to this page as I find more sites!! All online kids games featured at TurtleDiary.com are designed to bring out the best in kids and help them solve problems faster. Whether the need is to consolidate Math fundamentals or take the first step towards learning the English language with an ABC game, our online kids games listing features an extensive variety of games that are especially designed to help your kids with all streams of elementary education. Switch Zoo has 142 species, and the website features additional animal games, music created from animal voices, a reference section about all the animals in Switch Zoo, lesson plans, and poetry, stories and artwork created by students and other visitors. Funbrain’s games help students build on what they have learned in class and acquire new skills in reading, math, and problem solving. PBS KIDS is committed to making a positive impact on the lives of children through curriculum-based entertainment with positive role models and content designed to nurture a child’s total well-being. With a 360-degree approach towards learning and reaching children, PBS KIDS leverages the full spectrum of media and technology to build knowledge, critical thinking, imagination and curiosity. Into the Book is a multimedia package designed to improve elementary students’ reading comprehension, as well as their ability to think and learn across the curriculum. Based on current research, the project focuses on eight learning strategies: using prior knowledge, making connections, questioning, visualizing, inferring, summarizing, evaluating and synthesizing. Seussville—the official home of Dr. Seuss on the Web—is the place for children of all ages to play and learn with Dr. Seuss’s wonderfully whimsical books and classic characters. The Cat in the Hat, Green Eggs and Ham, Oh, the Places You’ll Go! and all of the Dr. Seuss books leap to life through interactive games and activities that will enrich each child’s reading experience. Whether it is Hidden Pictures® puzzles, Goofus and GallantTM, The Timbertoes®, Puzzlemania® or our gifts and toys for all ages, Highlights helps your children enjoy reading, learning and thinking. Starfall.com opened in September of 2002 as a free public service and has been teaching children to read with phonics ever since. Our systematic approach, in conjunction with phonemic awareness practice, is perfect for preschool, kindergarten, first grade, second grade, special education, homeschool, and English language development (ELD, ELL, ESL). Starfall is an educational alternative to other entertainment choices for children. A lesson about every single element on the periodic table! Firstaidforfree.com offers free online first aid courses that anyone can take. Our free online first aid training could equip you with the skills and knowledge to help save someone’s life. Simply work your way through our free online first aid courses to develop your lifesaving knowledge. Once you’re done, you can download a free first aid certificate. E-learning for kids is a global, nonprofit foundation dedicated to fun and free learning on the internet for children ages 5 – 12. We offer free, best-in-class course ware in math, science, reading and keyboarding. 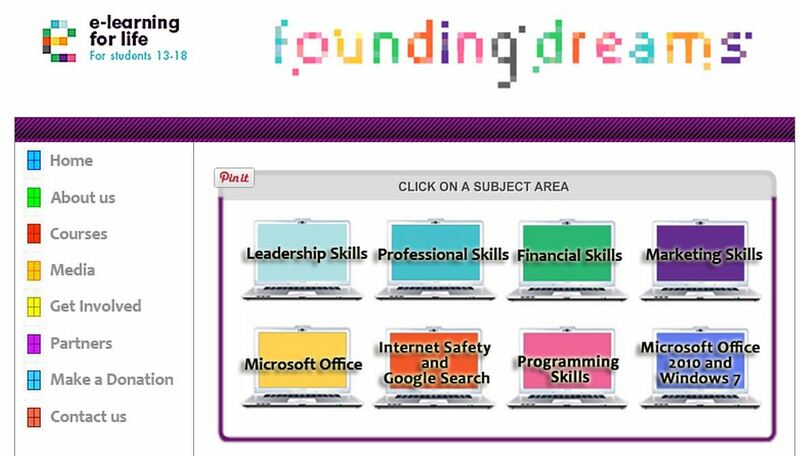 E-Learning for Life is a global non-profit foundation dedicated to high quality and free learning on the Internet for teenagers and students (ages 13-18). The main topics include: Information, media and technology skills, Life and career skills, Learning and innovation skills. The Habitable Planet is a multimedia course for high school teachers and adult learners interested in studying environmental science. We had so much fun checking out the sites today. Thanks! Glad you enjoyed them!!! I will be adding more so check back soon!! !